Respiratory Diseases - When Cough Is More Than Just A Cough? Respiratory Diseases – When Cough Is More Than Just A Cough? Respiratory diseases are acute or chronic disorders that affect the organs of a human respiratory system, namely, nasal passages, sinus cavities, throat, trachea, larynx, bronchi and lungs. Environmental toxins, particles of dust, allergens, viruses and bacteria irritate the delicate lining of the respiratory organs triggering a natural reaction to eliminate them from a person’s body. 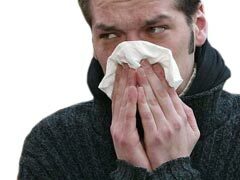 Respiratory organs immediately react by producing mucus that traps the invaders that are later to be removed by coughing or sneezing. Coughing is a natural reaction of your respiratory system to remove irritants from your airways, including, dust, viruses, bacteria, fungus, mucus and phlegm. If you suppress productive cough that helps eliminate mucus build up with over the counter or prescription medications, you are risking developing one of many serious respiratory diseases like bronchitis that can escalate to pneumonia, inflammation of the lungs, requiring a serious aggressive treatment. Cough could be dry or it could be phlegmy caused by mucus build up in your bronchi and airways. Some people experience especially bothersome coughs at night which could be a sigh of asthma that requires your doctor’s attention. A lot of patients with a long history of cough or a number of respiratory diseases also suffer from snoring or a more serious condition called sleep apnea. In these cases, an evaluation by a sleep specialist or a pulmonologist is highly necessary. Some of the more serious respiratory diseases that require immediate and complex treatment program are various cancers of the respiratory organs, tuberculosis, bacterial pneumonia and lung abscess, just to name a few. Most of these conditions affect previously predisposed individuals such as heavy smokers, patients with asthma, or individuals whose immune system is weakened by a long term illness, after a major surgery or from a chronic condition. These individuals should be especially careful with symptoms of coughing and see their doctor at the first signs of upper respiratory diseases. Respiratory diseases require a complex set of measures that are not limited to a conventional medicated approach. Besides traditional approaches to treat common respiratory diseases like asthma and chronic bronchitis it’s important to evaluate many underlying factors that are not normally taken into account, namely, a patient’s diet and living and working environment. Is there something in the environment that is causing the condition in the first place like a hazardous occupation or living in a polluted metropolis? Could your house be a source of dust, mold or dangerous toxins? Living in a certain climate that is too humid or too cold could also be causing the exacerbation of your respiratory diseases. For respiratory disease patients living by the sea or ocean could greatly remedy the condition naturally. As far as diet, certain products like meats, dairy, eggs and fructose can contribute to excessive mucus production that could be triggering your cough and other respiratory diseases symptoms. Trying one or several herbal remedies like turmeric, garlic and ginger that have anti-inflammatory properties could allow you to see less bouts of coughing and more periods of remission from your chronic illness. Consider alternative approaches to address your respiratory diseases like acupuncture, osteopathy and deep tissue massage.